This year, 43 million households in the U.S. plan to grow some kind of food (fruit, veggies, herbs, and/or berries). This number is up 19 percent from last year. Nearly half of these households plan to grow food in containers. Only 33 percent are citing economic reasons for growing their own food. Other reasons include wanting better tasting/safer/organic/locally-gown food, wanting to spend more time outdoors, and wanting to spend time with family. It costs about $1.80 per pound to buy food and about 35 cents per pound to grow your own. I personally plan to grow more veggies this year, primarily for health reasons (I need to eat more veggies!). I don't have too much sunny space, so in the past I've grown tomatoes in my flower beds. Last year I made a veggie bed out front, which had primarily tomatoes. This year I plan to add leeks, beets, garlic, onions, and green onions. And in a very raised salad box (kind of like this, using my potting bench as the table, due to the groundhog) I plan to grow lettuce, parsley, and Swiss chard. How about you? *Presented by Bruce Butterfield, market research director at the National Gardening Association, and Craig Humphries, director of marketing research at Scotts Miracle-Gro. Added 2/27: The presentation is now online, and the survey itself (The Impact of Home and Community Gardening in America) will be available in early March at the National Gardening Association. Up 19%?! That is great! Very interesting! Our mom only grew cherry tomatoes, chiles (brought the seed from Mexico, raised the plant and proudly ate "huevos mexicanos" the other day) and redcurrant last year. She "collects" mints, too and seems to thoroughly enjoy her special iced tea with them... Hopefully she'll grow catnip and valerian this year!!! Purrs to James and Fiona! I love growing my own fruit and vegetables - I know exactly what's been put on them (nice home made organic compost for starters! ), I love to decide what to have for tea depending on what is ready to be eaten, things taste so much better when they're freshly picked and, as Yolanda Elizabet so beautifully put it,it really does crank up your inner smugness level a notch! I grow vegetables because I like all forms of gardening.There is a feeling of satisfaction in eating something you have grown yourself, and it usually tastes better than shop bought. Almost 20% is quite an increase. I would give up a lot to continue growing my heirloom tomatoes. I do it for the taste. They are so good. I usually put in at least 12 plants and give away 80% of my fruit. Hi Monica, I always had a veggie garden until moving here, and boy have I missed it! My reasons weren't primarily economic but I'm ridiculously excited about my tiny new raised veggie bed. I'm sure I spent more money on the border material and the compost layered inside it than I'll save in grocery costs this year. I'm confident my initial investment will pay off by next year, and future amendments will come free from the compost pile. There are so many good reasons to grow vegetables, not the least of which is home-grown veggies just taste so darned good! In these economic times especially, the savings on the grocery bill are a wonderful perk. How cool this is! I have found that I'm steadily using more veggies in container arrangements with flowers. It's also super convenient to have things like peppers and herbs readily available next to the kitchen door! Hi Monica, I just joined the Garden Writer's A. and could have listened to that too, but didn't. As for growing more food, we began that in earnest last year and it worked out so well that more space will be used for food growing. We need to get more organized about the grid though and rotating the crops and succession planting. I have lots to learn but many seedlings nearly ready to go. All we need is that last frost date to come! Loved your post, Monica! It's been on my mind to attempt things I haven't tried before. I loved seeing the 'table' or 'raised drawer'. How cool?! I do grow tomatoes in pots on my deck; it's possible we could try some new veggies in a raised bed or even something like what you discuss here. Monica this time of year the produce in the grocery store has little taste so I look forward to growing my own this summer..not a lot ..havn't the room but I'll fit in salad greens and tomatoes! I'm closer to my destination!! SUNNY!! I guess I'm one of those statistics for growing my own food. I hope all goes well for all of us. Last Summer I put tomatoes, onions, carrots, parsley and rhubarb in my front sunny corner flower bed. I hope to do it again! (And perhaps I can work out a couple of other plans!) :-) Interesting statistics. Great statistics, Monica! I'm definitely doing more veggies this year as well. Barbara Kingsolver's book Animal Vegetable Miracle really got me fired up about it! Thanks for sharing. I think it is wise for us to grow our own food. With too much chemicals today, I don't know if I could trust others to produce food for my family and me. Oh silly me. Sorry but I mistyped my link. Here's the correct one. Sorry again. What encourages me more is the growing interest in buying local and organic. It's nice to see the Farmer's Markets around here growing. I'm not surprised by the increase in vegetable gardeners, but I am surprised by all those who plan to grow them in containers. 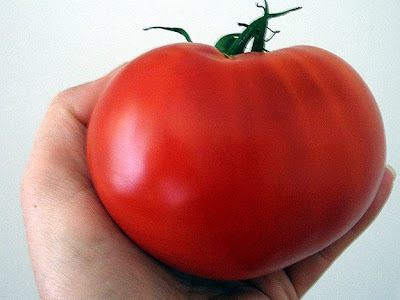 Tomatoes are my favorite veggie to grow, of course--nothing tastes like a homegrown tomato! But I'm going to try a few new things this year, including beets and some different varieties of old favorites. I still have produce in the freezer from last year!